Literacy in India has been increasing as more and more people receive a better education, but it is still far from all-encompassing. In 2015, the degree of literacy in India was about 72 percent, with the majority of literate Indians being men. It is estimated that the global literacy rate for people aged 15 and above is about 86 percent. In order to identify potential for intellectual and educational progress, the literacy rate of a country covers the level of education and skills acquired by a country’s inhabitants. Literacy is an important indicator of a country’s economic progress and the standard of living – it shows how many people have access to education. However, the standards to measure literacy cannot be universally applied. Measures to identify and define illiterate and literate inhabitants vary from country to country: In some, illiteracy is equated with no schooling at all, for example. 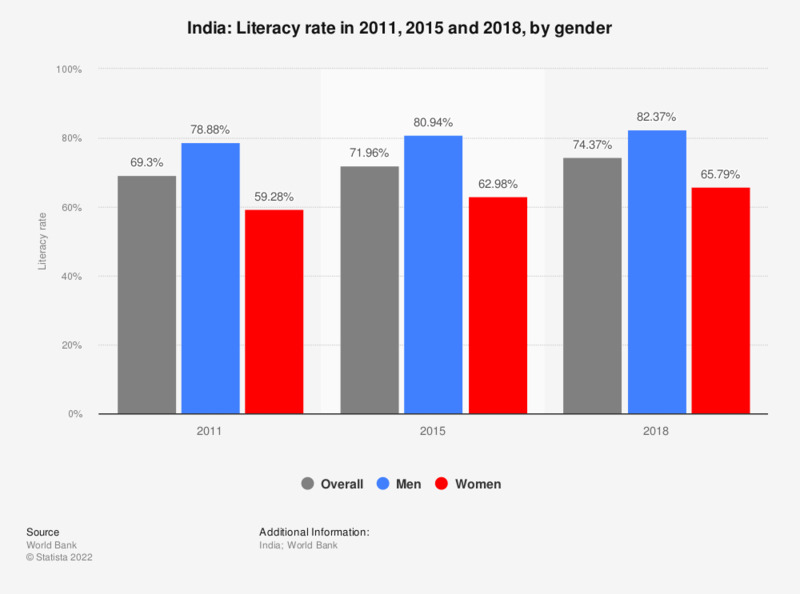 Globally speaking, more men are able to read and write than women, and this disparity is also reflected in the literacy rate in India – with scarcity of schools and education in rural areas being one factor, and poverty another. Especially in rural areas, women and girls are often not given proper access to formal education, and even if they are, many drop out. Today, India is already being surpassed in this area by other emerging economies, like Brazil, China, and even by most other countries in the Asia-Pacific region. To catch up, India now has to offer more educational programs to its rural population, not only on how to read and write, but also on traditional gender roles and rights. The source does not provide figures for 2012, 2013, and 2014.